ANDRIY.CO - Working with retail prices in the sale of goods. Working with retail prices in the sale of goods. The previous article described how to build the retail price at the time of arrival of goods in a warehouse. investigate, how to work with retail prices in the sale of goods. expenditure bill and add to the product. When we added goods in the consignment note, retail price of substitute products automatically from the registry and was 4 grn. Can we change it? Yes, quite. Moreover, in several ways. The first and most simple way - just manually set the new retail price, for example, 3grn. 97 kop. in the retail price. We notice that a field adjustment. Discount is automatically calculated and was 3 cop. Changed and the amount of the invoice. second method is to ask the retail price when selling - specify a value discount in the box. Set the discount on our chocolate equivalent, for example, 4 cop. retail price was the same 3grn. 96 kop., Together with a reduction of the same 4 grn. 00 kop. We reviewed the work with the retail price, as they say, the manual mode. Let's see, what means of automation, we have. 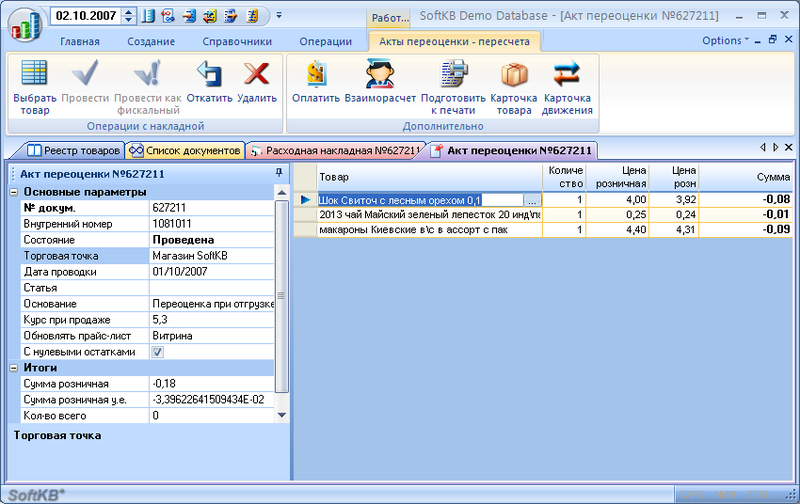 In the right pane of the properties of the invoice has the option «Choice of the retail price». By default, we are working with a «cost of the registry». This is a reference price change only through an act of revaluation. In addition to «the price of reestru» TCU2 contains 5 reference retail price for each commodity position (five speakers price list). Before you start writing the goods in the consignment note, we can choose, for whatever the retail price will be shipping (sale) of goods. Go to the Properties window, note the other retail price. add new product in the consignment note. for our product price «Consumer fact» is 3 UAH. 95 kop. It will automatically default in the retail price. Please note the discount remained zero. introduce a discount of 3 cop. As we can see, the discount is fixed relative to the selected retail prices for the price. If we are working on a third price-list price, reported it to the entry of goods, the discount will not affect the price on the roster, but the price on the price. Thus, we provide a very flexible with prices. Where applicable? For example, our client is working on price-list price «Consumer fact». For each item in the pricelist, under «Consumer fact» to provide an individual discount for another stage of the price list. By selecting any of the speakers price list, and adding items in the expenditure invoice, you can not worry about the correctness of substitutions required retail price. In addition, if the need for a commodity position to make a personal discount, simply enter it in the appropriate cell. It is necessary to speak of another important way of forming discounts. 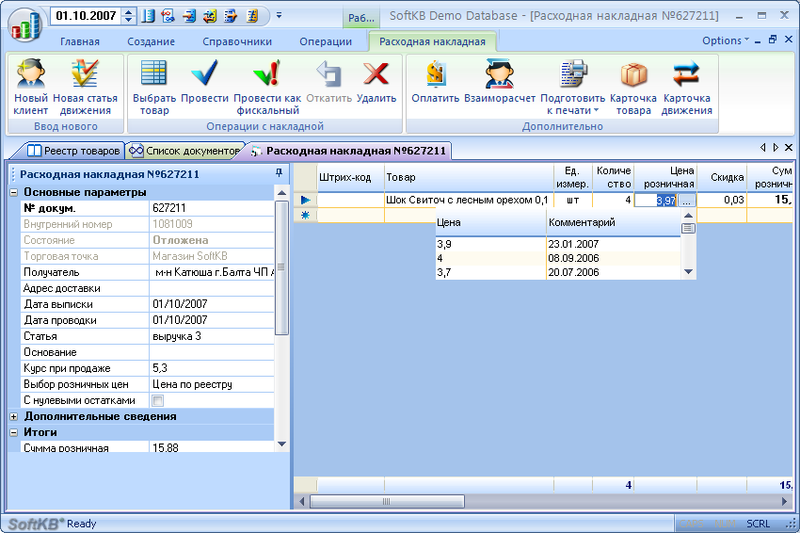 In the Properties window, note addressed to the parameter «discount» and enter it 2% (just type «2»). For the invoice price of all goods sales decreased by 2%. percent discount is not exactly equal to 2%? The point is that the system in calculating the discount produces rounded to pennies, so the discount may be close to the entered value, but do not always coincide. like the outcome. The price in the expenditure invoice, we can form in several ways. 1. Enter the desired retail price, either directly to the desired discount for each commodity position. 2. Choose the column of the price-list and introduce products in the consignment note. This would suggest retail price of the selected speakers price list. Actions of paragraph 1 of this case are also applicable. 3. 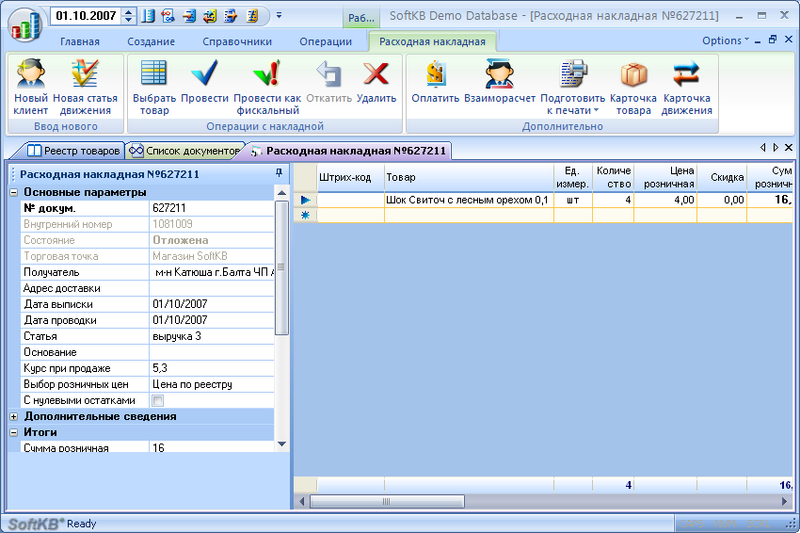 Enter the discount window in the properties of the invoice. Will be made to the automatic calculation of discounts for each product position of the invoice. We will invoice. This reassessment will be made automatically to all goods whose price differs from the price on the roster. In the process of wiring spending bill would set up a re-act on the shipment number. Go to the revaluation of the acts and open it. This act is a re-bound document. It can not roll back, change or delete without undo the main document (spending bill). When rollback spending bill automatically rollback and disposal act revaluation. Any sale of the revised retail price will be marked in a special document - Act of revaluation, which will include those items for which the sale price differs from the price on the roster. To prevent the operator to make adjustment, simply turn off right at the wiring of the revaluation. to track all sales of discount, simply open the list of revaluation for the desired period (eg one day). cart system user can set a limit to the maximum discount for a specific user.